This not your average model. Why? Because we have simplified the construction so it won’t take hours and hours to make. We simplied the hull by making it from 5 pieces of 3/4″ pine. We simplied the deck by including only the key pieces. 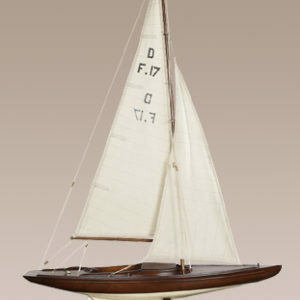 You can quit after you mount the masts and the rigging lines or spend a little more time and cut and attach the sails. 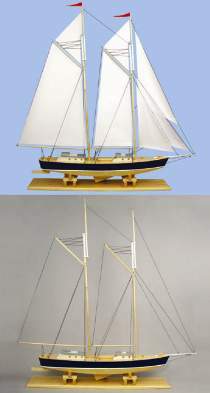 The plan includes FULL SIZE patterns for all pieces including the sails. This is an impressive project for the fireplace mantle, den or a child’s room. 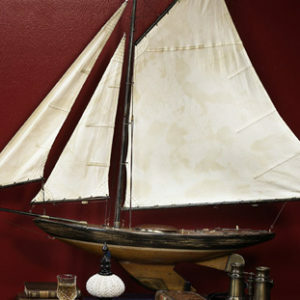 Measures approximately 46″ long x 46″ high. Order #7418 Brass Screw Eyes separately.